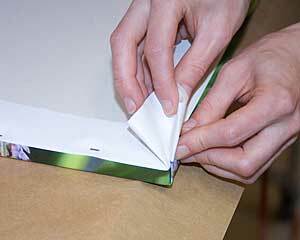 Using the edge of the frame as a guide, trim the excess canvas such that there is no more than 1.5” of material from the outside of edge of the frame. 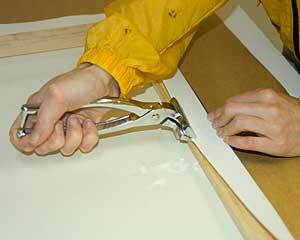 Place image face-down on the table and, starting with the top edge, grab the canvas with the canvas pliers with the chin/lip of the pliers levered against the frame. Staple the back of the frame opposite the pliers every 1.5” or so. Starting in the middle and working toward the edges helps. 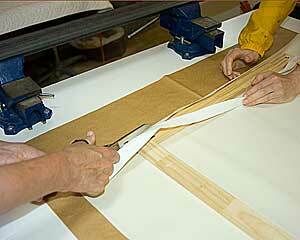 There will be excess material at the corners; fold the corners OR cut out a piece of excess and then fold. Staple corners and double check that all staples have been tapped flat. 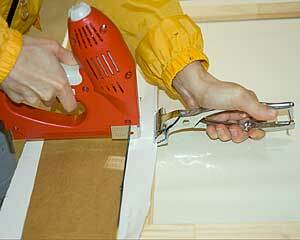 Spray protective finish onto canvas. Let dry 3 min, and repeat 3 times and then let it sit for a day. rem-Only apply spray after inks have cured for 3 days.